Switzerland……not often the first place that springs to mind when you think of an active cycling or walking holiday, but why not? Having spent 4 days at the start of September in this wonderful country I now have seen the glorious light! We were welcomed by representatives from Switzerland Tourism in London as well as from the Vaud Lake Geneva Region and the Fribourg Region. Over the 4 days and 3 nights, we toured all around theses wonderful regions, experiencing a great deal of the activities that Switzerland has to offer. 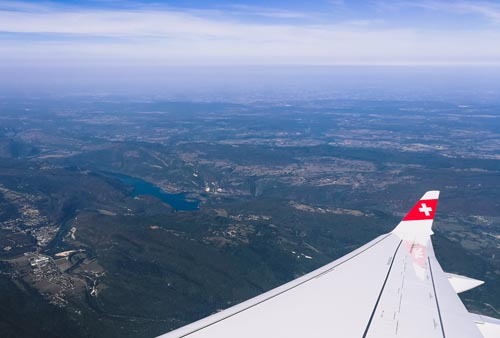 Starting off on our adventure we left Geneva Airport, destination Charmey and straight to the wonderful authentic town of Gruyère, otherwise known as the land of cheese and chocolate! We explored this majestic town by means of a challenge set out by our tour organisers, nothing was off limits. Points mean prizes and we set about learning and making a fool of ourselves in equal measure. The one thing I took away from Gruyère is that the very Swiss traditions of alpine horn playing and cheese making was still practised the same way as they have been for centuries in the present day! Now onto one of the highlights of the trip, yes you guessed it, a chocolate factory tour!! 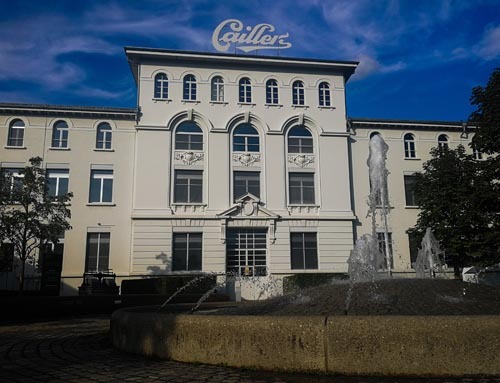 Not just any chocolate factory, very much the home of Swiss chocolate and chocolate as we know it today Maison Cailler. Not knowing that much about chocolate….ahem…. I was only too happy to be educated both by the wonderful walk through a demonstration of the origins of chocolate available on site here at Maison Cailler, and yes, the good bit, the tasting! There is much more to this dark gold than you expect, a real must see! 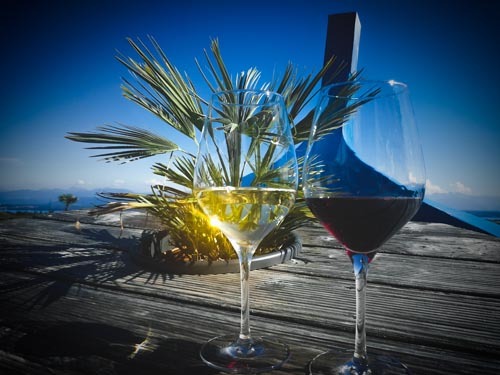 We were treated in the evening to an 8 course…yes, 8!…..tasting menu at the hotel of the Cailler family in Charmey. After which it really was time for bed! We awoke on the second day to the sight of a convertible bus awaiting us for the continuation of our Swiss adventure. Travelling a very short distance down the road to the home of Gérard, the local cheesemaker for a masterclass in the making of the famous Gruyère cheese! Then we did everything from milking the cow to making the cheese it was a great insight into the amount of work involved in making what we take for granted every day! Gérard and his small team do everything the traditional way including taking the cows up to pasture on the surrounding mountains and milking them at altitude. On from here, we travelled a very short distance by bus where we had a short walk in the wilderness along one of the many hiking trails to see some of the beautiful wilderness on offer in the Fribourg region of Switzerland. We then boarded our bus again for a trip up to Hotel – Restaurant du Lac Retaud, in short, a beautiful mountain hut restaurant which offers classes in yoga and mountain activities. One of the highlights of this journey for me personally was getting to see first hand the climbs on offer for road cycling in the Fribourg Region, including the famous Col de Mosses, and for a bonus with the roof off the bus! The views from here are simply breathtaking, whether it is down the valley towards Ormont-Dessus or up to the Glacier 3000, it was simply awesome, I could have sat here for days! We had the opportunity to partake in some yoga or a short hike through the surrounding hillsides to learn about natures garden and all the edible plants that can be found in this region. 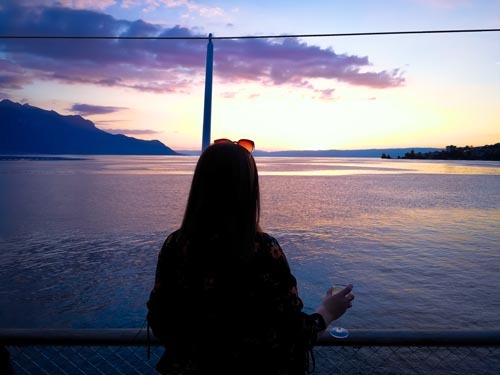 It was then time to set off for the stunning city of Montreux, otherwise known as the home of Freddie Mercury for a great portion of his life, where he bought Mountain Recording Studio on the shores of Lake Geneva. There his statue still stands to look down Lake Geneva in his iconic pose. We weren’t done yet however, off no, it was now time for the GoldenPass Line MOB Jazz Train up to 1150m where our evening meal was served at Le CouCou restaurant. After a fantastic meal and talking in the views over the lake, we departed for our hotel in Montreux for a well-earned rest! Day 3 of our whirlwind tour of Switzerland brought us onto Lake Geneva for the first time, not aboard just any old boat however, we boarded the simply magnificent La Demoiselle, a twin sail Barque boat, an experience I will never forget is getting the opportunity to raise the main sail by hand, it certainly came down quicker than it went up! La Demoiselle dropped us in the quaint town of Saint-Saphorin in the Region of Lavaux. It was now time to swap wind power for leg power as we collected our E-Bikes for a tour of the vineyards. There would be no better way to see the vineyards than by bike but given the gradients of up to 26%, the electric assistance they provide was certainly welcomed! 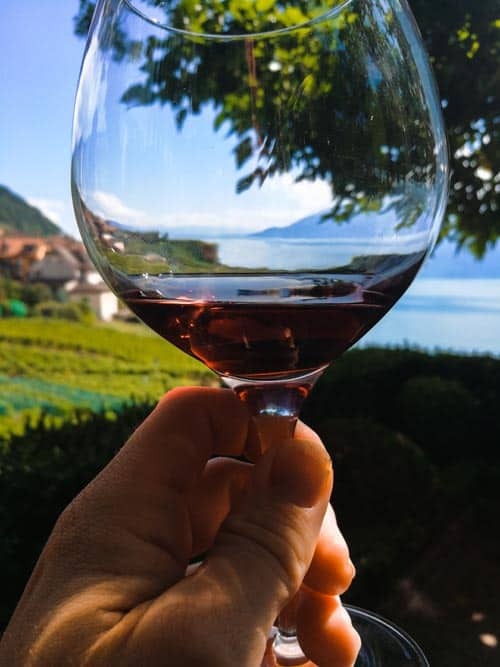 Our guides not only showed us the way but gave us a great insight into the benefits of growing wine on the slopes and the difference in characteristics of the wine that can be had by doing so. On to our lunch stop for the day at the famous Clos de la République wine estate in Lavaux. We were greeted with a tour of the cellars and of course, a cold crisp glass of the Chasselas produced here. After our tour, it was on to the terrace overlooking Lake Geneva for our meal, lovingly prepared by our gracious hosts. After we had all enjoyed such an idyllic meal we were heading off back on the road down to the Olympic city of Lausanne. Here awaited another challenge which whilst doing so, we enjoyed seeing the beautiful Cathedral, narrow cobbled streets and period architecture of this now sprawling city. 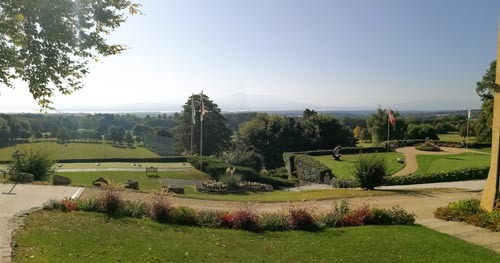 It was then down onto the lake shore to visit the Olympic Museum in Lausanne just meters from Lake Geneva’s shore. Talking of meters, first up was another challenge, a 100m sprint. Could anyone match Usain Bolt. 1 member from each of the 4 teams was chosen to race the track to see who could get closest to the world record. I ran 13 seconds which ended up being the quickest time but still a good bit shy of the superhuman 9.58 seconds!! 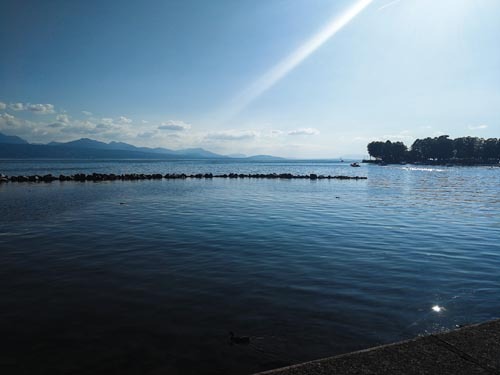 After we had recovered we had some free time to either take a stroll along the shore of Lake Geneva to the hotel and relax or visit the Olympic Museum. I personally opted to visit the Museum and I am so glad I did. You really would need half a day to do this visit justice, but in about 40 mins we managed to see a fair bit of the exhibits on view and I was really taken back with the attention to detail of a lot of the artefacts from past Olympics. It was now time for a quick turn around in the hotel to be ready at the docks for 6:30pm sharp (we are in Switzerland after all) for our lake cruise with dinner! We boarded Belle Époque paddle stem boat which would be our floating restaurant and viewing platform for our short cruise on Lake Geneva. This really was the best way to see the lake and we were treated to a wonderful sunset before dinner was served on the lower deck. After our voyage, we were taken up to a roof top bar for a dessert buffet and drinks reception to cap off our last night in Switzerland. After breakfast, we gathered outside the hotel and we were greeted with the sight of our transport for the last day…….VW Campervans!! 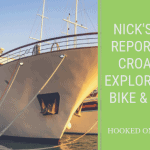 This was a fantastic experience and what a different way to get around! We headed first for Golf de Bonmont where we met Gavin Healey our golf professional for our golf experience. This was great for me, an avid golfer, to get the chance to see how the Swiss do golf, and it is very well done indeed. The facilities on offer were excellent as was the tuition from Gavin and his team. After we had a small putting competition which I did rather well in…ok…I won haha! We were back into the campervans and off to our vineyard visit at La Cave de la Charrue in Commugny. We had a very interesting tour from our hosts and we were taken through all the facilities at the vineyard, so close to harvest there was a lot going on indeed. It was then out into the middle of the vines for a fabulous wine tasting of all the 4 wines produced here with nibbles. The care and passion of the owners was on show and they were excellent at explaining everything and answering questions in plain English. It was then back into the campervans once more for the short journey to today’s lunch stop at the Best Western Hotel in Chavannes-de-Bogis. Everything here was wonderful from the service, the food, the company and of course the views over to Mont Blanc in the distance. It was now time for our last ride in the campervans and our last transfer of the trip, destination Geneva airport for our flights home. Thank you once again to our hosts for this unforgettable experience and the countless people involved in making this trip the success it was. Now, it is on to putting together some great cycling and walking itineraries for our customers, so you too can enjoy Switzerland as much as I did. Stay tuned for developments and in the interim, if you have any questions regarding holidays in Switzerland, please just get in touch!